Alex (27), Jesse (33), Piper (32), Duncan, Shirl, and Jamie (35). Today the Campton Contingent of Clan McDougall gathered to prepare for Saturday's celebration of the wedding of Jesse McDougall and Caroline Wheeler. I expect there will be future posts, so tonight I will keep it simple, and post only this informal group picture, taken following Piper's late arrival from Aspen, Colorado. Jamie and his lovely wife Amy had arrived earlier from Orlando, FL. Jesse and Alex came by car. Yours truly served as Manchester Airport chauffeur. Tomorrow, Shirl and I will head for Shaftsbury, Vermont, where the wedding is to be held. 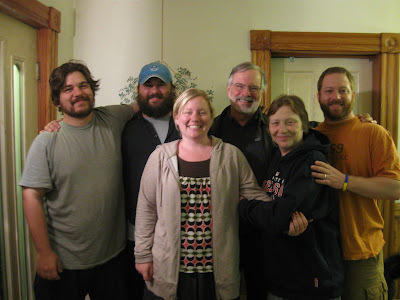 There we will be meeting up with daughter Christal (46) and her daughter Hannah (12), and our Brian (43) with his wife Nika and their son Moses (1), all of whom constitute the Colorado Contingent of the Clan. Please use no profanity in your comments. My granddaughter and other young people will be reading this blog. Thank you. Mossy Antlers Mean "Spring in NH"